To manage the Customer Information section, click on a Customer or Contact name from the Customer section on the left hand navigation. Click the Edit button on the top right hand corner of the window. The button go from blue to green, which means you are in edit mode. 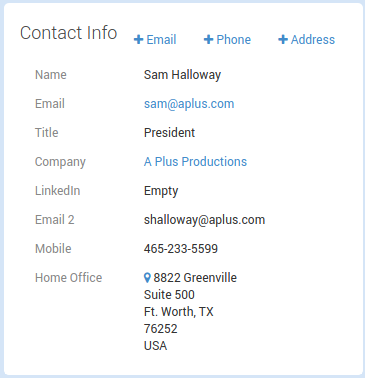 The fields which are editable in the Company/Contact Info section will become blue. You may also reset a Contacts Customer Hub password by clicking on the “Send Password” button. Here are the available fields depending on whether you have a Company or Contact selected. Please note that our Customer Insights feature will automatically populate a company logo and description if you include a website on the company record. Customer Insights can be disabled here. Add Email: Click the +Email button to add a secondary email address to a contact. If the contact emails your support address with any of their listed email address, TeamSupport will associate the ticket to the contact. Add Phone/Add Address: Click the +Phone or +Address buttons to add this information for the Customer. Icon: The Company icon comes from our Customer Insights feature. Click here to learn more. Name: Name of the Company or Contact. Primary Contact: The primary contact for this customer. A pick list will appear for you to choose from all of the Contacts associated with the Company. Description: A brief description of the Customer. Website: The Customer’s website. If you populate this field, our Customer Insights feature will pull information back from the internet and populate the description and company logo fields. Parent Company: You may group your customers in a hierarchical fashion by indicating Parent Companies. Click here to learn more about Customer Families. Existing Phone and Addresses: Any phone and addresses that have already been added to the Customer. Email: The email associated with the Contact. Title: The business title for this Contact. Company: The organization that this Contact is associated with. LinkedIn: You may provide the URL to the contact’s LinkedIn account. If provided, our Customer Insights feature will automatically supply the contact’s image from LinkedIn. Organization ID: A unique System ID for each Company. Default Support User and Group: You can select a User or Group to be automatically assigned to any ticket that is created by a Company. Domains: You may list the Company domain(s). Multiple domains can be separated by a comma. If a domain is listed, and a ticket is created or if a Chat is initiated with an email which was not already a Contact in the system, it will be associated to the Company based on the a domain match. Portal Access: Indicates if a Company is given Customer Hub Access. Service Agreement Expiration Date: You may indicate the date on which the Service Agreement should expire. A Company with an expired Service Agreement will display with a red background on any ticket. Service Level Agreement: Indicates the selected Service Level Agreement (SLA). Support Hours Per Month: You may indicate the available Support Hours that a Company is allotted per month. Active: Indicates whether a Customer is Active or Inactive. API Token/API Enabled: This field will allow you to give your customer access to their data within your TeamSupport account. Inactive Reason: You may indicate the reason a Customer has been marked as Inactive. Active: Indicates whether a Contact is Active or Inactive. Portal User: Indicates if a Contact is given Customer Hub access. Portal View Only: The default is false. If checked, the contact will have read-only access to the Customer Portal. This feature is currently unavailable in the Customer Hub. Prevent email from creating and updating tickets: You may set this option if you are getting spam or want to block emails from certain contacts. When set, we will no longer allow emails into your account from this address. Prevent email from creating but allow updating tickets: You may set this option if you want to prevent emails from creating tickets, but if the ticket is already created, this contact may update tickets. This is useful if you only allow certain individuals (like supervisors) from your customers organizations to submit tickets, but once tickets are submitted, anyone from the company can update. 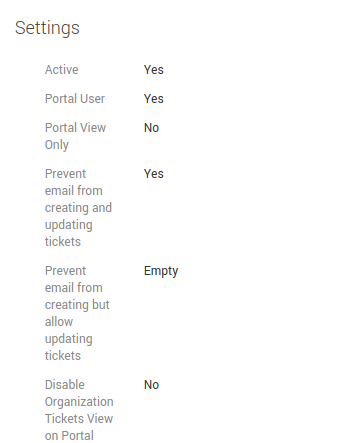 Disable Organizational View: If you would like to disallow the viewing of Organization wide tickets from the Customer Hub, you can set this option to “No”. Disable Organization Children Tickets View on Portal: With our Customer Families feature, by default, a contact within a Parent Company can view tickets of all Child Companies. Set this option if you would like to disable the ability to view tickets of child companies. Last Logged In: Displays the timestamp of the last system login.